The Chilworth science park research facility has four purpose built 3000 litre outdoor holding tanks. 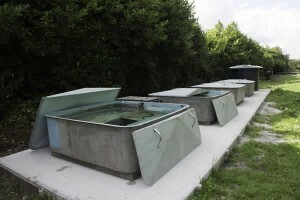 Each tank is filtered via a large gravity fed external filter complete with U.V. filtration. Aeration is provided through a venturi system on the filter outlets and via a large capacity air pump. Each tank has a separate 240 volt supply for additional equipment.